Hello everyone! I would like to start this blog post by saying thank you to all of you! I have just recently reached 200 followers. You are all amazing and I couldn’t thank you enough. You following means a lot to me. I really wish that I could see everyone that reads these posts. Wouldn’t that be cool? In this post I am going to share with you all a few of my favorites! These are favorites everywhere from skin care, makeup products and everyday life situations. I hope that you all enjoy reading my favs just as much as I enjoyed writing about them! So let’s jump right in. My first favorite of my entire life is going to have to be my event and wedding planning business!! I have been dreaming about creating my own business for a really long time. About a year and a half ago I got up the nerve to sign up for an even and wedding planning corse. I passed all of my lessons and finally received my certificate. 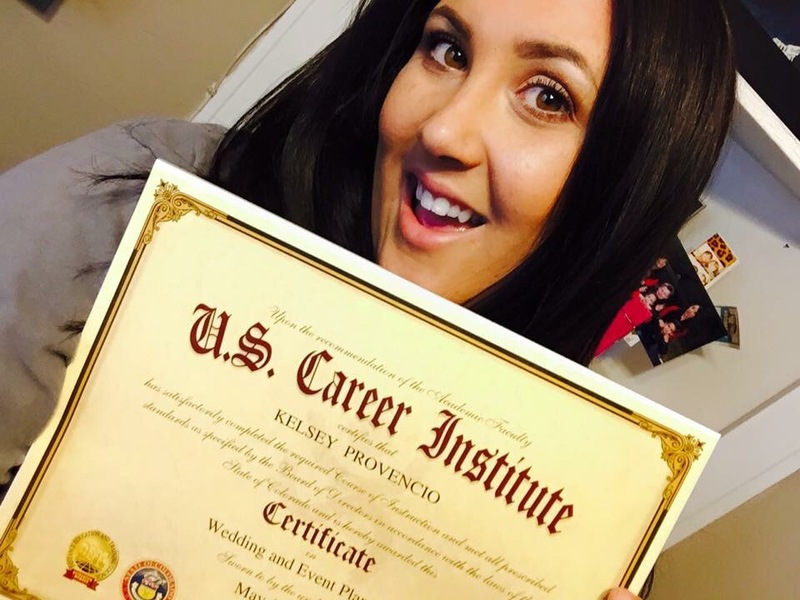 After I received my certificate I began thinking and trying to decide who I wanted to apply and work for. After a couple of weeks of looking up businesses and thinking long and hard. I decided to start my own! Why work for someone else when I can be my own boss? 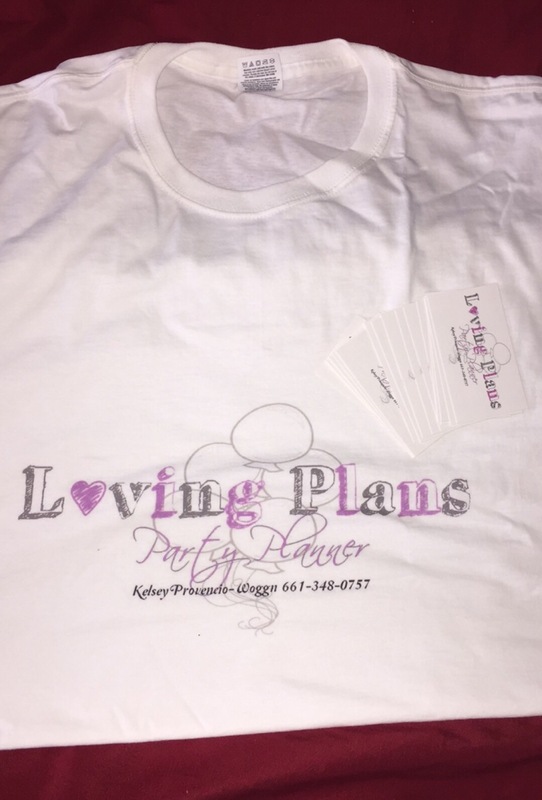 So, I came up with Loving Plans and my name and have created a logo, Facebook page, a T-shirt and some business cards. I have never been so excited about something before. 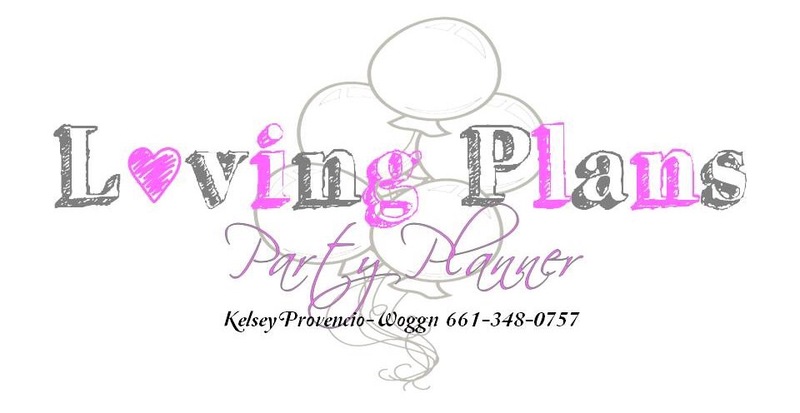 Loving Plans has so far helped decorated for a quinceniera and have been a day-of coordinator for a wedding. Here are some some pictures of my logo! I’ll leave the link to my Facebook page Here. Feel free to check it out and let me know what you think. I would greatly appreciate some feedback. Now, let’s jump on into some fun stuff! The first product I have been loving is the Origins GinZing refreshing scrub cleanser. I use this product when I feel like my skin needs a really good cleanse and exfoliating. I purchased this at Sephora and it was $19.50. I will leave the link Here, if you would like to go check it out. My next Origins product is the Orgins Clear Improvement Active Charcoal mask. I purchased this a long time ago, when I first tried this mask, I hated it. It broke me out like crazy, but when I used it a few more times I realized that it really cleared up my face. It difs deep into your pores and brings out all of the nasty gunk that is beneath the surface. Once if bring out all of the nasty stuff, you really see an amazing difference. Again, I purchased this product at Sephora and it was $26.00 and you can find that Here. A couple of months ago I won a free facial from MaryKay and ended up really loving the facial wash and moisturizer. It is from the time-wise collection, it says that it is a 3 in 1 cleanser. It removes my makeup, exfoliates and cleanses my face all at the same time. Before I apply the moisturizer I make sure and use my Garnier Micellar water just to make sure all of the makeup is off of my skin and everything is refreshed! Lastly I apply the moisturizer, the next day my skin feels and looks so amazing. Ok now my my favorite part! The makeup, isn’t that why we are all here? The first product I would like to talk about is EVERWHERE right now. 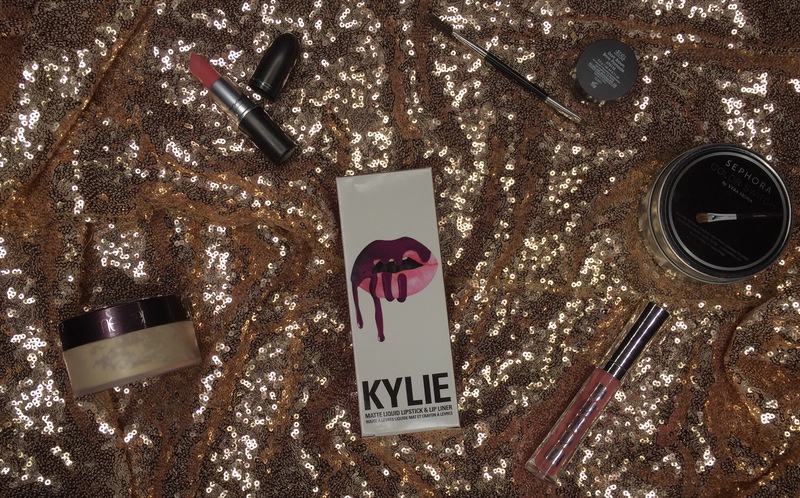 The Kylie Lip Kit! I was finally able to get my hands on Kourt K. Beautiful color, great application and smells amazing. If you would like me to go in depth and create a look using this product, just comment down below. I would be more than happy to do that for you. Hopefully next I can get my hands on Posie K! If any of you have that one let me know what you think. A lot of lippies this month, next on my list is Mac’s Please Me. This is a gorgeous matte everyday pink color. My favorite gloss of the month is Dolly by Buxum! I got a mini one in a pallet for Christmas a couple years ago and fell in love. I finally ran out of it and purchased a full size. I have been using the gloss non stop. I put it on top of most of my lip colors. I even love the color on its own. For brows I have constantly been using the Ardell brow pomade with the Anastasia number 7 brow brush. These two together are the best couple in the universe! They go together like Danny and Sandy from Grease! Next I am sure that you have seen this being raved about often as well. This is the Laura Mercier translucent powder. One word. Amazing. Last but not least I purchased Sephoras Color Switch! This is just a sponge like product, it allows you to use the same face or eyeshadow brush without deep cleaning the brush in between. All you do is brush it inside the pan and it takes out all of the extra powder and color on your brush! My last couple of favorites for April are these two right here! 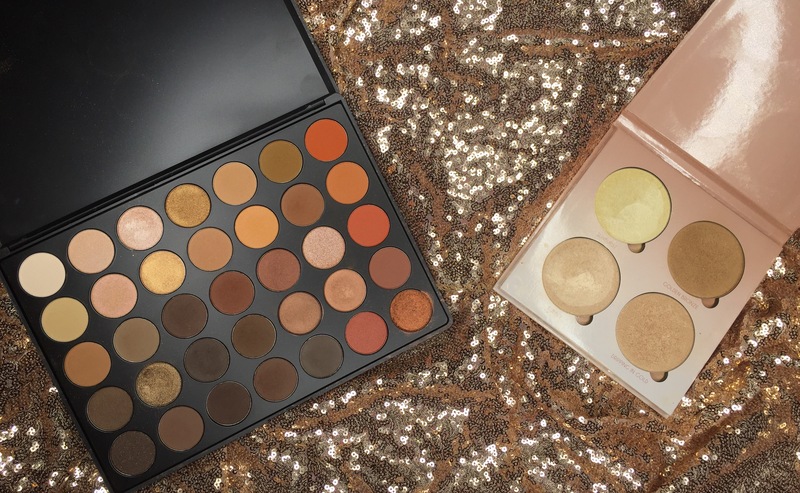 The Morphe 350 and the Anastasia Glow Kit in the colors That Glow! These two are absolutly incredible. The Morphe 350 is a great everyday eyeshadow pallet, great mixture of shimmer and matte colors. Very inexpensive if you can get your hands on it. Anaistasia Glow Kit has been the highlight of the month, get it! I crack myself up. I have another post just on this product, if you would like to see swatches, feel free to check that post out. I have a could of music favorites for you all, if you like a variety of music, you are going to love these songs! And this completes my April Favorites! I hope that you all enjoyed this post, please let me know what you think! If you have any thoughts or share any of these favorites, I would love to hear about them. Thank you all for reading! Next Post Lake Tahoe Trip!